Twenty five folk turned up for the Salmon Run, one of the most prestigious events in the Angling Calendar and of these, nineteen took part in the match, netting a total of four hundred and five fish! Altogether, 17 salmon and 35 trout were landed, with the prize for heaviest salmon (40lb) going to Mister Potty Nutbutter. Second prize went to the dwarf, Norgi, and third to Mister Simbo Rumblebelly. Best catch went to Pennyroyal with Willltanner in second place and Rubellita in third. The Pipeweed award for the weediest catch went to Harbull. The next important date in the fishing calendar is March 15th, the start of the close season for coarse fish, which will be in place until 15 June. Coarse fish are any freshwater fish except salmon and trout. The close season does not apply to still waters, such as the Bywater pond and the Rushock bog. Asked about the next fishing trip, Pennina was tightlipped about the date, but hinted it could be early in April. The location remains to be announced. 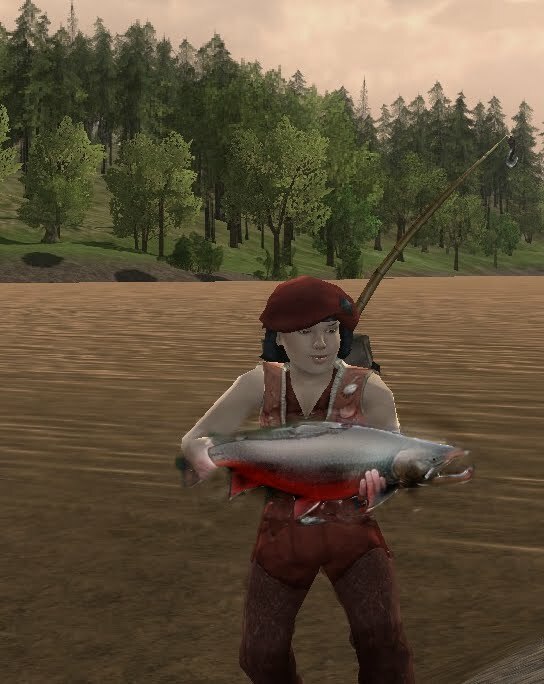 Miss Penina, seen here measuring up one of the many caught salmons.